They appeared to be four feet tall or under, were dressed in tight-fitting suits which revealed their human shapes, and which appeared iridescent, for they were green or purple as they moved about in the late afternoon sunlight. Each of the "men" wore a box-shaped or square yellow headpiece. On a road near this village a Mr. Billon and a female friend saw hovering in a field very close from the ground a luminous multi-colored almost square-shaped object. They could see two figures about 1 meter in height walking back & forth very rapidly in front of the object. The witnesses watched the scene from about 100 meters away. The figures appeared to be wearing brown-green colored uniforms. The witnesses were in a state of shock after the incident. ..small man about 4 feet tall with a large head and long arms. Described as five feet tall, weighing about 90 to 100 pounds, milky white smooth skin, without hair. Illustration by James Neff ©2003. Based on the description by Reme & Jose. When asked how close this rendering comes to what they saw, Reme says "Almost as if you were there... It doesn't get any better." They were small, very frail and had large heads. Source: Larry Hatch, U computer database, case # 1000, citing Michel Figeut & Jean-Louis Ruchon, OVNI: Le Premier Dossier Complet des Rencontres Rapprochees en France, p. 50. At three o'clock in the afternoon in Amfreville-la-Mi-Voie, Seine-Maritime department, France a small disc-shaped UFO landed on the banks of the Seine River. Two short humanoids, about three feet tall, got out and shortly later reboarded the craft. The UFO lifted off silently, and flew off to the southeast. Sources: Tacoma News Tribune, July 8, 1947; Ted Bloecher, Report on the UFO Wave of 1947, case # 547. During the afternoon in Tacoma, Washington three male witnesses reported that a disc-shaped object landed on their neighbor's roof. Several "little people" emerged, but disappeared when reporters approached. Signor R.L. Johannis. 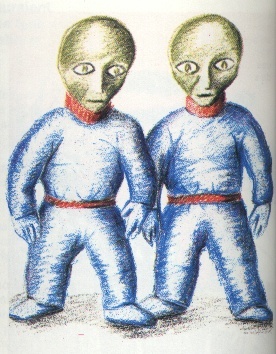 Two small humanoids, about three feet tall or less. Next, he was confronted with the presence of two child-sized beings (about 3 feet tall) standing by the object. They were wearing dark blue coveralls with bright red collars and belts, and a spherical, transparent helmet on their oversized heads. Their faces appeared to have a greenish color, their eyes were large and plum-colored with a vertical line in the center and no lashes or brows. Their hands were claw-like with eight fingers, four opposed to four, on each hand. Mr. Ottaviano A. Souza Bueno. There emerged from it 3 creatures of less than medium height, with extremely rapid movements, who started collecting samples of soil, using a tube which made holes in the ground. The witness later woke up and found himself on a different field surrounded by several short entities, described as having large heads, large slanted almond shaped eyes, narrow mouths and small noses, they had bulging foreheads with short stubby hair. They all had boxes on their chests with tubes protruding from it. At times they appeared to grasp the tubes and breath into it. The beings gesticulated and spoke among themselves in an unknown language. Praying mantis-creature encountered around noon time by David Huggins at Georgia farm when he was eight in 1950. He associated entity with small, grey beings, which David thought were androids programmed to do work for the praying mantis and tall humanoids. On the top of the bizarre craft what appeared to be hatch covers were open and the observers saw about ten small figures moving about. Protruding from the top to about eight feet above the "deck" was a hoop-shaped object which rotated slowly. When it appeared to be pointed at a location directly opposite the two observers, it would stop and so would the "little men." The man and his wife got the distinct impression that the concentration was on their location and ducked behind the rock. Small bodies were retrieved and hidden by the Air Force. Small corpses of the purported occupants. Sarah Shaw & Jan Whitley. Most of the beings were 5-feet tall and most of these had oval heads. Some had heads wider at the bottom that at the top and were apparently female. Two taller beings appeared to be the leaders. Arthur G. Stancil (previously known by the pseudonym "Fritz Werner"). Stancil saw one body recovered from the crash. 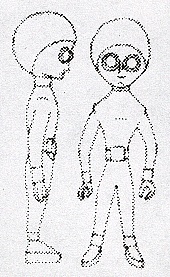 It was humanoid, about 4 feet tall, with brown skin and wearing a silver-metallic flight suit. Mid-August 1953. Ciudad Valley, Mexico. Salvador Villanueva. Scrambling out from under the car, he was confronted by two pleasant-appearing men about 4½ feet tall who were clad in one-piece garments from head to toe, wore wide shiny perforated belts, small black boxes on their backs, and metal collars around their necks. They carried helmets which Villanueva compared to those "worn by pilots or by American football players." Salvador Villanueva, a taxi driver, was trying to repair his broken down car out in the country when he was joined by two pleasant looking men 4.5 ft tall, wearing one piece gray corduroy garments covering even their feet, with wide shiny belts. A woman saw 2 objects on the ground and 3 1.5-meter tall men running toward the craft. They had oversized heads and wore helmets and boots. Marie-Louise. The witness then saw two small beings occupied in collecting something around the meadow. Amazed, the witness did not dare to move from the dirt road, it didn’t appear that the entities had noticed her. The witness described the beings as very small, 1 m or less, with a very bulky head (perhaps a helmet?) and of a metal gray color. Marius Dewilde. Two beings 3-1/2 ft. tall, coveralls, diver's helmet; dark mass on ground; dog howled, witness blinded by light from craft, paralyzed. Mme. Leboeuf. One being 3 ft. tall, diving suit, helmet, large eyes; flat circular craft; dog barked, being approached, witness fled; circle of crushed foliage found at site. Bernard Devoisin, Rene Coudette. One child-sized being, diver's suit; glowing orange domed disc on road, bicyclists approached, being entered craft and took off. Angelo Girardo. One small figure in diver's suit; bicyclist came upon 10-foot disc on ground, being next to it; being entered craft and took off. Roger Barrault. One 4-1/2 ft tall being, diver's suit, bright eyes, two lights on chest; bicyclist at dusk encountered being, who disappeared into woods; no craft seen. Gilbert Calda. One 4-ft tall being, dark coveralls, large eyes; children roller-skating, shiny round craft landed near them, being emerged, made unintelligible sound; they ran away. Three motorists. Four 3-ft tall beings; motorists stopped to watch hovering disc that descended into woods; two entered woods to investigate, saw beings enter domed disc and take off. Dr. Henri Robert. One 3-ft tall being; one of four circular objects zigzagged down in front of car, witness felt shock, engine and lights failed; being visible in light from UFO . Rosa Lotti nei Dainelli. Rosa Lotti had stopped in her tracks, astonished and curious. But her surprise was only just beginning. From behind the "spindle" she beheld two strange beings emerge. "Almost like men, but of the size of children," was her description. November 28, 1954. Petare, Venezuela. Driving a truck, Gustavo Gonzalez and his helper Jose Ponce found the street blocked by a luminous sphere 8-10 ft in diameter, hovering 6 ft above the ground. They got out to investigate, and saw coming toward them a dwarfish being 3 ft tall, with claws & glowing eyes. Gonzalez grabbed the little man, who wore only a loincloth, & lifted him up, finding him surprisingly light, hard, & hairy. The entity gave him a push than knocked him 15 ft. Gonzalez then tried to stab him, but the knife glanced off. Ponce saw 2 others emerging from the bushes with soil in their hands. They jumped up into the sphere, and shone a blinding light at Gonzalez. His antagonist also jumped in, and the craft flew away. Gonzalez was left with a deep scratch in his side. Lorenzo Flores, Jesus Gomez, Four 3-ft tall, hairy, strong beings; UFO like two bowls rim to rim just off ground; beings tried to drag witnesses on board. J. C. Sutton family. Two or three 3-1/2 ft tall beings, large heads, big ears, large luminous eyes, long arms, clawlike hands, luminescent torsos; disc-shaped craft landed, dog barked violently, beings approached house one or two at a time, floated at times. Small man 3 and 1/2 feet tall. Long thin arms extending to the ground. Ran away seeming to use its arms to aid its locomotion, similar to a monkey. May 10, 1957. Beaucort-sur-Ancre, France. Michel Fekete, M. & Mme. Rene Lepot. Four beings under five feet tall, gray skin or garb, oversized heads; darkness and distance concealed features; bicyclist blinded by light, saw silhouettes of small beings in road, fled; luminous object pulsating from red to white flew away at 45-degree angle. As the whirring sound died down, two "dwarfs with oversized heads" wearing glowing colorful clothes stepped out of the craft, carrying a large hose. A moment later a small entity with a large head, tight fitting clothes, and tubes like a respirator was seen. 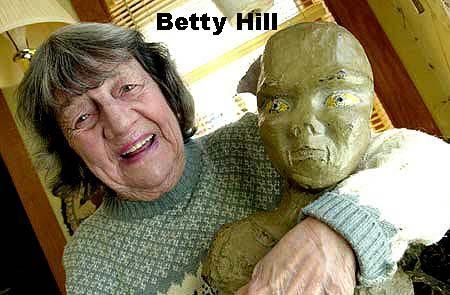 The Betty and Barney Hill abduction. Gary Wilcox. Two 4-ft.-tall beings, silver-white garb, egg-shaped craft just above ground; beings communicated in English. Gary T. Wilcox. Suddenly, however, two small humanoids appeared standing next to the craft. They were dressed in seamless uniforms with hoods covering their faces. Each carried a tray that appeared to be heaped full of earth that had been removed from his field. Lonnie Zamora. Two 4-ft.-tall beings, white garb. Five boys observed one 3-ft.-tall being, black garb, helmet, glass-like faceplate; dome-shaped craft seen on ground; whistling sound attracted attention to being perched in tree, who floated to ground. Edmund Travis (age nine), Randy Travis (age seven), Floyd Moore, Billy Dunlap, Garry Dunlap. The boys said they were playing in a field when they suddenly noticed a small human-looking man, wearing a black suit and black helmet. The helmet had a transparent visor over the eyes, "antenna-like wires" on top, and was decorated with unidentified symbols and letters. Several humanoids plus robots; luminous object landed, beings trapped witness in tree, prolonged confrontation. Twelve humanoids observed at distance after two discs landed on hill; appeared to be engaged in repair operation for hours. William Blackburn. Three small humanoids floated from hovering craft, confronted witness. Maurice Masse. In front of it stood two figures, not quite four feet tall, dressed in tight gray-green clothes. September 10, 1965. Pernambuco State, Brazil. Sao Joao. Two small, brown-skinned humanoids, one-piece garb; two discs landed, beings emerged, objects rose a few meters, unintelligible vocalizations. Dario Anhaua Filho. The beings observed by the Filhos and the bank executive were small, about the size of seven-year-olds. One was wearing overalls, the other chocolate-colored pants and a gray collarless shirt. The third being had a squarish, flat head and was wearing what appeared to be a surgeon's apron. All three, including the ship, glowed brightly. Betty Anderson. The beings were small. Three to five feet tall. Grey beings in a hoping like motion. Sketch of one of the occupants by Claude. Claude Edwards. The small figures were also gray-green and about 3 feet tall. They moved around directly beneath the device. As they moved he could see arms or levers which also moved rapidly. Each of the figures had either very wide set eyes or goggles. He also could clearly see a protuberance where the nose and mouth would have been. He could see no lets or movement at the lower part of their bodies. Sales executive "John Gilbert." His car was stopped at an undisclosed location and he was surrounded by a group of strange men about 3.5 meters tall with broad foreheads, elongated eyes and hawk-like noses. Driving home from work in Kent at 0215A, David Morris rounded a bend and noticed an orange red, glowing cone shaped object, 25 feet high and 12 feet wide, hovering several feet above a field to his left. When he looked back at the road he saw four of five little beings running back and forth across the road directly in front of his car. Less than 4 ft tall, they were stocky; and either had abnormally large heads or were wearing helmets; they glowed the same orange red color as the object. He slammed on his brakes, but not in time to avoid hitting one of the little figures, and he saw an arm fly up with a mitten-like hand---no distinct fingers---as the car collided with it. At the same time he smelled a strong metallic odor, "like brass." He stopped some distance ahead, believing he had struck somebody; looking back, he saw a group of the beings clustered around what was apparently the one he struck. Suddenly realizing that what he hit was certainly not human, he became frightened and "burned rubber" getting away from the place. He arrived at home in a very upset state and later, found that the impact with the being had left dents and scratches on the bumper of his car. One small being appeared in doorway of circular craft that landed beside road, E-M effects on car; soil samples taken. Three 3- to 4-ft tall beings, light-colored clothing, helmets, moved around beneath cigar-shaped craft with windows; physical traces found at site. Source: David F. Webb and Ted Bloecher, HUMCAT: Humanoid Sighting Reports, case 1967-56, citing Antonio Ribera. At 3:00 a.m. an intense light coming from their patio had awakened the daughter of the Count de Ribas on the Mediterranean island of Palma de Majorca, Balearic Islands, Spain. From her window she saw two small figures apparently speaking to each other. They had very large heads, possibly due to the presence of helmets, and huge eyes. Sidney Zipkin. Two small beings, shiny black garb. Saturn-shaped craft seen near ground in truck headlights; beings boarded, took off straight up. Stanley Moxon. Three 3- to 4-ft tall beings, white garb, translucent helmets from disc with three legs, gathered specimens. Ron Hyde. Two humanoids about five ft. tall, silvery suits, round helmets, emerged from disc with dome; one moved toward witness and gestured, he fled in fear. Francois Delpeuch (13) and his sister Anne-Marie (9). They were 1-1-20 metres tall, not all of the same height. Nos. I and 2 (see sketch) were the smallest, and the tallest was No. 4, the one with a "mirror" in his hand. Two small beings, black garb, entered disc-shaped craft and took off. Jose Edrosa. Small beings, large heads, white garb; beings seen moving toward brilliant round object on ground, car lifted, witness in severe shock. Guy Tossie, Willie Begay. Two small humanoids from disc with dome, aggressive encounter. Three small white-clad figures around disc with dome, red lights; physical traces found at site. Patrolman Herbert Schirmer. Humanoid beings, between 4 1/2 to 5 feet tall, escorted him from his car and into the ship, where the “leader” gave him a tour and explained various things about themselves and their mission on earth. Senora Valentina Flores. A strange being about 1m. 10 cm in height. While the female witness appeared frozen in a trance, her associate reported two short entities behind the dome clothed in tight-fitting uniforms. Denis McMahon. Surrounded by three short figures. Remembered details after hearing Bud Hopkins on a radio show. The appearance of a three-foot tall thin limbed creature. Aristeu Machado. Two small humanoids on rim of Saturn-shaped craft with flashing lights on the underside; craft took off, skimming ocean surface. Two young men, P. Aliranta and E J Sneck, were working in the woods when Aliranta noticed a 15 foot metallic object, shaped like two saucers put together, and with four thin legs, descending in a clearing 50 feet away. As it landed, a little entity just under 3-foot tall glided to the ground from an opening in the underside; dressed in green one-piece "diver's suit," it wore a helmet with a circular faceplate. Mike Shea. The fourth one was small and wore a black silky suit with a zipper up the front, somehow this being seemed "ancient" to the witness. An air force sergeant was called to duty in the middle of the night, states that he was led blindfolded to an area where he was instructed to guard three bodies stretched out on a table. The bodies were about 3-feet tall with large heads and off-white skin. No other information. Five small beings, yellow garb, headgear, moved quickly back and forth near dome-shaped craft with body lights. One small being, round helmet, head moved like robot, E-M effects on car; no craft observed. Two 4-ft.-tall humanoids, silver garb, seen alongside road three separate times; no UFO seen. Two 3-ft.-tall beings, reddish color, entered craft (no description), which took off. Three 5-ft tall beings, high foreheads, slanted eyes, gray coveralls, from yellow saucer-shaped craft; abduction case. May 7, 1974 Coatsville, PA.
Three small beings, gray skin, clawed hands descended from disc-shaped craft with four legs atop hospital, made squeaky vocal sounds, saw witness, reentered craft and took off. The beings were described by the witnesses as about five feet tall, of light skin with big ,almond shaped eyes and small lower jaw. They were reported as being very strong. Mme. Le Bihan, Riec-sur-Belon. 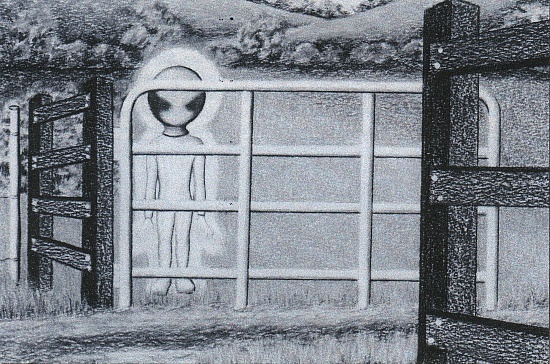 Three 1.7-meter-tall stocky humanoids, round heads, silver garb, from brilliantly lighted dome-shaped object with portholes, swaying back and forth near ground; beings walked heavily, rocking back and forth. January 12, 1975. North Hudson Park, New Jersey. Although only O'Barski was close enough to see the little figures. Masato Kawano (7 years old) and Katsuhiro Yamahata (7 years old). A ladder was extended to the ground, & a humanoid slightly over 4 ft tall disembarked. Both boys could see another, smaller humanoid in the cockpit, holding a control lever. Alois Olenick. Two small humanoids, grayish skin, visible in dome of Saturn-shaped craft. Charles L. Moody. He told of finding himself aboard a strange craft, and of a kind of telepathic communication with aliens who were about four feet eight inches tall, with large, domed, hairless heads; large eyes; a small slit-like mouth; small ears and small nose; five-digit hands with no nails. October 7, 1975. Utterson, Ontario, Canada . Small humanoids, dark eyes, gray skin. A. Ordonez. One 3'/2-ft.-tall being, green garb, helmet, backpack, four fingers on hands, seen from balcony, no craft seen; being fled when lights turned on, floating upward. On a cold snowy day in 1978, abductee Pamara Johnson, who had already been abducted several times starting when she was very young, and her family were returning from a visit to relatives near Abington in Wayne County. The UFO hovered over the snow covered tree tops which later had dead tops. At the sight the family was seized by fear. Next they found themselves driving home and about 3 hours were missing. Pamara was in such a state that she hid on the back seat floor and once home crawled into the house from there. Later that day she bled from her female sexual orgin and felt empty. She had been carrying a fetus as confirmed by her doctor, but later learned her fetus was gone. In later months she began to remember what had happened while in the clutches of the aliens in the UFO where her legs were spread-eagled on an apparatus that held her legs apart. Four short alien Grays were around her working. They used a long vibrating wire type of tool to remove the fetus. This tool was fastened to other devices. The process was painful. She also recalled being shown a wall where rows of transparent containers held little fetuses. So we are led to believe that this particular UFO had harvested other fetuses within the populace. Wouldn't this be a logical conclusion? I suppose when the aliens met their quota of fetuses, the UFO then left this dimension returning from where ever it came. Pamara's sister was also abducted. I was unable to find out about the father and several children. Her sister would never talk to me. I did learn that each December at abduction time a scar that she always hid with her hair on her neck begins to erupt for a time. It sounds like she was implanted to me. Riccardo Boscagli. Two small humanoids, green garb, helmets, floated from domed disc on road, circled car, E-M effects. G. Filiputti. One 1-meter-tall humanoid, silver tight-fitting coveralls, almond eyes, emerged from disc with dome, appeared to be making repairs on rim. Under hypnosis, he recalled that he re-opened his eyes and saw four, short, gray-skinned figures moving through the bright light towards him. William J Herman. The beings were 4 to 5-feet tall, seemingly frail with pale, soft skin. John Wright. They ETs were just over five feet tall. Cathy Davis who was the subject of the book and the TV movie, “Intruders” was abducted at 10:50 near Indianapolis, Indiana. Source: MUFON UFO Journal, August 1991. 3:00 AM. EST. In the witness's bedroom a short humanoid pointed a beam at the witness in bed. When the being had left a three-foot long by 18" cylinder shot straight up into the sky outside. The witness, who at the time was wheelchair bound was resting alone in a beach near la Jolla when out of nowhere a large 100-foot long torpedo shaped craft approached and began hovering above him. The witness entered into a light trance and was somehow lifted into the hovering craft. He was then examined by several small humanoids with large heads and huge slanted eyes. He felt no fear. Later he found himself seated inside his van, his wheelchair neatly tucked away in the back. Incredibly, over the next few weeks his condition began to reverse itself until he was finally able to walk again with the help of a cane. A farmer reported seeing an object with brilliant lights descend and land slowly near him. Two short humanoids wearing black tight fitting outfits emerged from the object. These approached the witness; signaled to him, then spoke in an unknown language. The beings left when the witness told them he could not understand them. A six-meter circle of burned grass was found on the site and the witness suffered from headaches after the incident. In March of 1999, FATE Magazine published this article about a creature photographed by an anonymous alleged abductee. The photo is dated early morning December 1, 1987. Notice the length of the arms on the creature. The photographer said the alien appeared to be carrying a box of some sort. Alec Newald set off on what should have been a 3-hour drive to Auckland. He arrived feeling tired and confused, but was even more stunned to learn that he had lost 10 days and had no idea where he had been. He was able to remember being escorted onboard a huge craft by a female humanoid and taken to a room where he was told to wait. Soon he was approached by three humanoids, one tall, looking like the previous female humanoid, the second a little shorter and was male. The third much smaller, and walked ahead of the other two. He described the short humanoid as slightly built with a round head and rather unusual squinty eyes, which were well spaced and placed rather lower than that of humans. He had a very small mouth, no ears were seen, and the nose was barely noticeable. Newald was struck with an almost overpowering feeling of his presence. It was as if the being’s energy was being projected and absorbed by his body. The humanoid said, “Welcome,” and told Newald that he was the designated “Guardian” of this section. The humanoids communicated mostly by using telepathy. Newald was apparently taken to another “world” where he arrived at a huge city, which was very neat and orderly. He had noticed when the craft had landed that the city lacked any tall buildings and most of its construction was pyramid shaped dwellings and made of what appeared to be some kind of transparent material, just like tinted glass. He also saw large antenna like structures. Some of the buildings resembled those on Earth, but the outer walls were sloped back at a thirty degree angle and set back some distance at each floor level, making them look like steps up on a hill. These were apparently the dwellings, which were mostly circular in shaped or tube like in shape. The color inside the buildings was mostly a pearl white with perhaps a touch of silver gray within. A soft light seemed to radiate from everywhere. After learning much he was eventually returned back home and to his vehicle. Two men, Tomas Vendel and chemist Laine Pilova. The figures were described a short humanoids, with long knee length arms. The domed disc now slid back a panel revealing two short humanoids, described as having gray wrinkled skin and claw-like hands. A third humanoid now appeared and moved with a mechanical like motion as he joined the other two. The dome then closed and the disc departed with the same jet-like roar. A mother and her two young sons were resting in their home when they noticed a strange object hovering over a house across the street. The object was described as a domed gray disc with bright white windows around its circumference. The windows were wider at the bottom than at the top. A dark line seemed to rotate inside the windows. The object emitted a fuzzy white glow from its flat bottom. It then drifted slowly away. That same night the younger boy had a strange dream-like experience. He found himself at the nearby schoolyard where he saw several landed gray domed discs. A short gray skinned being befriended the boy then accompanied him back to the house. The boy remembers being told several "things" that he could not remember. A police officer standing guard at the entrance to the local airport noticed some short figures that appeared to be running around on a platform that was going to be used to tie up the radar blimp. Upon investigating the site he was confronted by several short large headed humanoids that ran into different directions as he approached with his vehicle. The beings were thin, about 4-foot tall and with long thin arms. The beings ran into a nearby wooded area and disappeared. During the same time a large bright top-shaped object reportedly landed in the same location. Trucker Carlos Alberto de Jesus. Seconds later two humanoid figures, small in size about 1.20 m in height emerged from the object. They wore a one-piece light colored outfit with a diver's helmet with transparent visors. They had what appeared to be tubes connecting from their backs to the helmet. Behind the visors, De Jesus could see shiny cat-like eyes. He could even make out a small figure, wearing some kind of helmet, through the windows on one of the decks. Four humanoids emerged from the object. These were described as 1.45 meters in height, very large heads, as in proportion to their bodies, short arms, and huge staring eyes. Katherine Francovich/ It stood about 4-feet 9-inches tall. The being was gray in color and about 6-feet tall...The witness remembers seeing the other witness on the floor, as if frozen apparently being guarded by a short gray humanoid. Polaroid photographs by Filberto Caponi. 62 children from Ariel School, a private primary school in Ruwa (about 20 km from Harare) observe UFO and occupant. The little man was dressed in a tight-fitting black suit which was 'shiny' according to one observant girl (11 years of age). He had a long scrawny neck and huge eyes like rugby balls. He had a pale face with long black hair coming below his shoulders. Source: Albert S. Rosales, Humanoid Contact Database 1994, case # 2364, citing Brazilian UFO Report, Vol. 1, No. 1. Two observers watched a luminous greenish sphere land nearby them. Two humanoid figures appeared next to the object. They were described as 1.20 meters tall, with very pale skin and four-fingered hands, large staring eyes, and two small holes for a nose. One of the witnesses directed a flashlight at the figures, and a beam of light from the object immediately disabled it. The beings and the object then left. Crushed grass was found at the scene. A Mr. BPL. One was about one meter tall with a large baldhead and big eyes and the other was a bit larger and hairy except for the hands and face. Silvia Bedoya. At a remote mountain village several Quechua Indian shepherds tending their flocks watched six objects flying over the area. According to a witness, Silvia Bedoya, 40, the objects apparently emerged from nearby Lake Cococha. The objects formed what seemed a protective circle around a larger mother-ship type object. The flight of the objects illuminated the whole valley in an eerie deep purple type of light. The "mother ship" landed upriver from the village. Soon two occupants emerged from the object. These were described as 3 feet, 3 inches tall, with large oversized heads, long spindly arms and short bandy legs. They wore gunmetal gray helmets and matching one-piece coveralls. The humanoids took out transparent containers and, ignoring the shepherds, collected many samples, like soil, grass, mountain weeds, & water from the nearby river. Soon the humanoids entered the large object and all the objects shot away into space @ high speed. Two shorter humanoids arrived and carried the children from the back seat of the vehicle. Jose Mannuel Castro. Small creatures "looking like monkeys" emerged from the object, and the vehicle left surface impressions and footprints similar to those found at Entrimo. A witness encountered a humming silver disc-shaped object on the ground. Three short beings only 30 cm tall were seen next to the object. The beings wore silvery-white inflated suits, with round helmets and appeared to be collecting items from the ground around the object. Ground traces and electro-magnetic effects were reported. No other information. Source: Denis Rozhnov, "Komsomolskaya Pravda in Kaliningrad" February 27 2004 # 37. Several meters from the disk three entities appeared to be taking soil samples. One of the aliens who was apparently the leader was about 2 meters in height and was standing apart from the other two, which were much shorter than he was and were actually collecting the samples. The humanoids were bending down in ways utterly impossible for normal humans; their bodies appear to be much flexible. Carlos Airton Machado. At this point he noticed 3 short figures standing next to the object. Thinking they were children he yelled at them. The figures suddenly entered the object through an opening and it rose up at high speed emitting a loud whistling sound. Mauro Diniz Brumana. Near the object stood two humanoid about 1.20 meters in height wearing tight-fitting metallic outfits. Juan Achurra. These were short and silvery in appearance. Moving in a stiff robot like manner they approached to within 2 meters of the house. They appeared to be carrying something resembling flashlights. Odete Fortini. On the center of the object a door opened and two humanoids about 1 meter in height stepped out. They seemed to be interested on the vegetation around the object. After a few minutes of investigating the area they re-entered the object, which became bright again and left at high speed. Jose Da Silva saw a large disc shaped object with several windows and a small door-like opening in which two 2-meter tall humanoids were seen to enter. Five geography students. Suddenly a small door opened and two short humanoids came out. The object and the humanoids were about 200 meters away from the witnesses. The little men seemed to be collecting ground samples when they became aware of the witnesses presence. They ignored the witnesses and after several minutes reboarded the object, which took off at high speed. Deep ground traces were found at the landing site. Keely. When one of them turned and looked at me, I realized they weren't human. For one thing, the arms were too long and the bodies were too thin. Their skin had a pale glossy look, and their heads were very large, but had lumps all over the top of the scalp. I stand 5'3" tall, and they looked about one or two inches shorter than me. It started to walk toward me, but I bolted back to my tent. They looked to be about the size of my oldest nephew, about 4 feet tall, but they looked very skinny, like they had no meat on their bones. Small humanoids have been seen in a substantial number of cases meeting the high strangeness standards. There are large numbers of reports, and a purported videotape of the dissection, of "little gray men." All seem to share the common characteristcs of a small stature, large dark eyes, and tiny mouth.